SIDE EVENTS at COP22/CMP12 in Marrakesh, Morocco. SIDE EVENTS at COP21/CMP11 in Paris, France. SIDE EVENTS at COP20/CMP10 in Lima, Peru. SIDE EVENTS at COP19/CMP9 in Warsaw, Poland. "Realizing Low Carbon Asia - Conribution of Ten Actions -" was published. 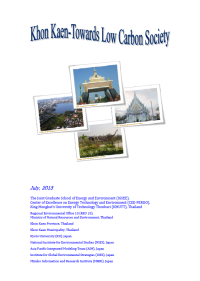 Report Khon Kaen - Towards Low Carbon Society was publisnhed in July 2013. 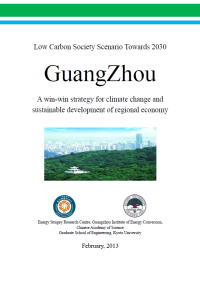 Report Low Carbon Society Scenario Towards 2050 GuangZhou was published in May 2013.
was held on May 17, 2013. 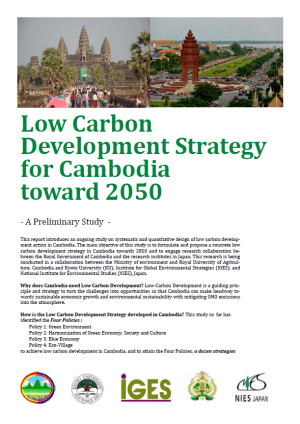 Low Carbon Development Strategy for Cambodia toward 2050 ‐ A Preliminary Study was published in May 2013. Vietnam Workshop: Low Carbon Society in Vietnam was held on April 25, 2013 in Vinh Phuc, Viet Nam. Cambodia Workshop: A Systematic and Quantitative Design of Low Carbon Development Plan for Cambodiawas held on April 22, 2013 in Phnom Penh, Cambodia. Reported in the national newspaper Rasmei Kampuchea (Light of Kampuchea) (in Cambodian language only). Report 'Preliminary study on Low Carbon Development towards 2030 in Gyeonggi Province, Korea' was published in December, 2012. 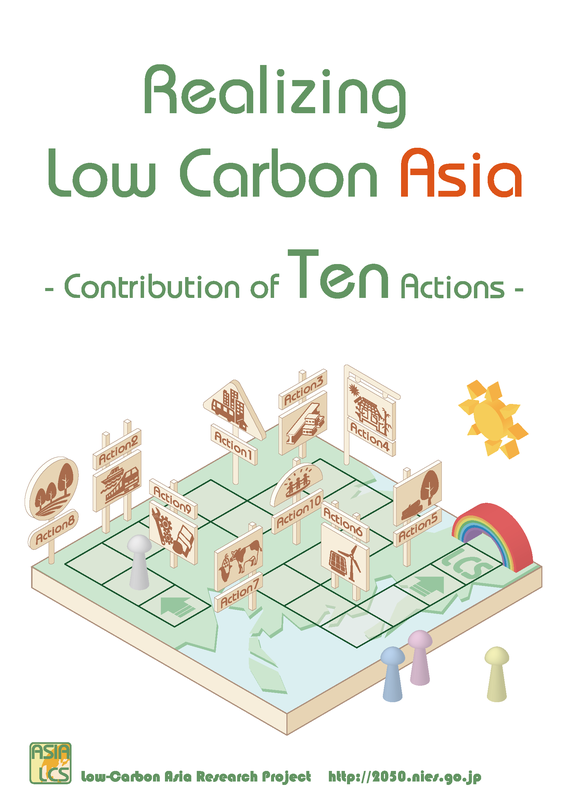 Brochure "Ten Actions toward Low Carbon Asia" was published in November, 2012. COP18/ CMP8 Side Event was held on November 30, 2012 in Doha, Qatar. Workshop on Exploring Potential for Low Carbon Society in Vietnam was held in Hanoi on May 31, 2012. Workshop "Designing and establishing Cambodian Low Carbon Development Plan" was held on May 29, 2012 in Phnom Penh. The workshop details are described in the article in Ministry Magazine issued by Ministry of the Enviroment of Cambodia. On the occasion of the East Asia Low Carbon Growth Partnership Dialogue to be held on 15 April 2012, the National Institute for Environmental Studies (NIES), the Institute for Global Environmental Strategies (IGES) and Japan International Cooperation Agency (JICA) will jointly hold a side-event to introduce our concept to promote “Knowledge Platform for Low Carbon Development”, which aims to help developing countries create and implement low-carbon and resilient development strategies compatible with their development goals. COP17/CMP7 side event: 'Low Carbon Society (LCS) in Asia: fom Planning to Implementation' was held on December 2, 2011 in Durban, South Africa. The Report on ‘Low Carbon Society Bhopal 2035’ was released on 24th September 2011 at a symposium in Bhopal, India. The report shows that Bhopal has about 40% Greenhouse Gas emission reduction potential over Business as Usual level in the possible LCS Scenario in year 2035. Seven Actions have been suggested that can impact the existing energy consumption pattern as well as GHG emissions in future. These actions, though, identified separately for the ease of communication, are inseparably linked in the LCS framework and can only work in conjunction towards achieving the vision. Report "Evaluation and Medium- to Long-Term Strategy regarding Transportation Systems toward a Low-Carbon Society"
Report "Evaluation and Medium- to Long-Term Strategy regarding Transportation Systems toward a Low-Carbon Society" are available. Report "Putrajaya Green City 2025" are available on this website. This report outlines the Low-carbon Scenarios and pathway of Putrajaya, Malaysia in the next 15 years based on quantitative integrated modeling of the future sosiety, economy and environment. Symposium "Asia LCS scenarios and actions -How to achieve sustainable low-carbon society-" was held on February 22, 2011, at International Conference Hall, JICA Research Institute, Tokyo. "Shifting to Low-carbon and Climate-resilient Development in Asia and the Pacific"
COP16 and CMP6 (COP/MOP6) side event "Shifting to Low-carbon and Climate-resilient Development in Asia and the Pacific"will be on 18:30-20:00, Friday, 3 December 2010 at Cancun Messe , Cancun, Mexico. "Low-Carbon Asia: Visions and Actions"
COP15 and CMP5 (COP/MOP5) side event "Low-Carbon Asia: Visions and Actions"was held on 14:45-16:15, Thursday, 10 December 2009 at Bella Center, Copenhagen, Denmark. Report "Japan Roadmaps towards Low-Carbon Societies (LCSs)" are available on this website. This study shows quantitative roadmaps for introducing countermeasures and policies for reducing CO2 emission by 70% compared to the 1990 level by 2050 in Japan. AWG (Ad Hoc Working Group) side event "How to realize global emission reductions: long-term pathways and supporting mechanisms"was held on 13:00-15:00, Thursday, 3 November, 2009 at ADELFA, Barcelona, Spain. Reports of Symposium of this project "Path toward Low-Carbon Society: Japan and Asia" and Expert Workshop of this project "Toward Low-Carbon Society: Japan Scenarios and Asian Challenge" were published.